Specificity Region between residue 275 and 325 of human neural precursor cell expressed, developmentally down-regulated 4-like using the numbering given in entry NP_001138439.1 (GeneID 23327). 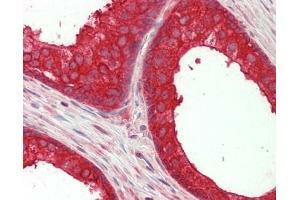 Usage: Immunohistochemistry: Antigen retrieval with citrate buffer  pH 6.0 is recommended for FFPE tissue sections. Human controls: Prostate Carcinoma.